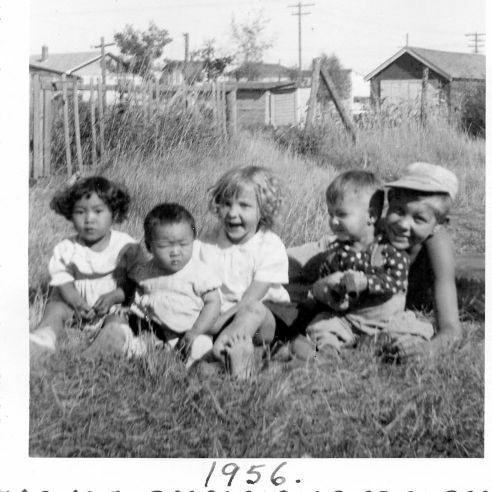 Five months after my birth I arrived on Canadian soil. My mother tells me that I slept through the whole trip from Hong Kong to Humboldt. Growing up in a Chinese restaurant, I had my afternoon naps in the midst and commotion of dishes, cutlery and loud voices placing food orders. When I say I can sleep through a tornado, you know why. Shortly after our arrival into Canada, tuberculosis struck my Mother. She was sent away to a Sanatorium for treatment for a lengthy period of time. Because my father remained in Hong Kong, my sister and I were placed in the caring hands of a wonderful family, the Schreiners. In this picture, I would be just over a year old and the scowl you see on my face is the same one I wear every day. I’m not angry about anything, I just find myself constantly analyzing everything around me. So…it is an analytical face. From left to right, my sister Lyn, my analytical face, Linda, Alan (a.k.a. Buzz) and Bob. These siblings and their parents represents my loving Canadian Family. This was the family that made all my childhood memories special and I thank them with all my heart.